The following books are available in many public libraries or often can be located for limited use through inter-library loan services. Jones, Charlotte. F. Westward Ho! Eleven Explorers of the West. NY: Holiday House, 2005. 233 pp. including Illustrations, Maps, Time Line, End Notes, Bibliography, Index. The eleven explorers described are, Robert Gray, George Vancouver, Alexander Mackenzie, John Colter, Zebulon Montgomery Pike, Stephen Harriman Long, James Bridger, Jedediah Strong Smiith, Joseph Reddeford Walker, John C. Fremont, and last John Wesley Powell. Personal biographies and the noteworthy events of their lives are told in a manner to capture interest particularly for upper elementary and secondary level readers. Interspersed with the text are an abundant number of illustrations. These illustrations are black and white copies of paintings, drawings, and photographs, primary source items, found in 23 Western and National Museums and Libraries. Each of the five chapters has a map indicating the travels of the explorations chronicled in the chapter. Unfortunately, the travel of Jedediah Smith is not accurately portrayed. For example: he traveled on the east side of the San Joaquin river (not the west side) going through that valley. When leaving California he crossed to the north coast and followed the coast in California and Oregon as far as the Umpqua River before turning inland to reach Fort Vancouver on the Columbia River. These inaccuracies should not prevent a young reader from having a general understanding but raise a question about the five maps. This was the editor’s responsibility or that of the publisher. Historical authenticity of the work is encompassed by end note citations by Chapter presented at the end prior to the Bibliography. These citations indicate page and an abbreviated entry with the reference noted. In this manner the flow and easy reading of the text is uninterrupted and not distracted but here verified for the scholar. Following the end notes is a selected bibliography which demonstrates the major resources of information on the explorers. A time line credits historical events from 1754 through 1902. These entries are related and relative to the biographies that have been reviewed. An index completes the book. On a readability survey using the Fry index, the text approximates Fifth Grade. On the Raygor scale it rates approximately Grade Eight. These two nationally recognized readability guide lines averaged together indicate an approximate reading difficulty at Grade Seven. The book was recognized in 2005 with a distinguished citation, The Western Heritage Award for Juvenile Literature by the National Cowboy and Western Heritage of Oklahoma City. It is recommended that the book be placed in all the Middle and Secondary Schools in America. Nelson, Sharlene and Ted. Jedediah Smith. NY (Watts Library) Scholastic Inc. c2004. bibliography and index ISBN 053112287-5 Juvenile literature: Discusses the life of Jedediah Smith an explorer of the American West and leader of the mountain men. The Nelson’s have prepared an excellent collection of over thirty illustrations, photographs, and drawings, most in color, to support an accurate biography written for pre adolescent/ adolescent age readers. The style of writing provides a high interest level. Sidebars are in profusion through the text to explain terms and contextual concepts. In addition a three page glossary of terms provides brief, clear definitions for the reader. Another addition is a selection of books, videos, organizations and on line sites to assist students interested in further study. This book should be on all school library shelves. To order: go to amazon.com, then books. Type in Sharlene Nelson, then, Jedediah Smith. This hard cover edition sells for $16.80 plus shipping. In about six months it will be available in paper back at about one-half the price. Miller, Helen Markley. Jedediah Smith on the Far Frontier. NY: Putman, 1971. Illustrated, map, index, pp. 95. Mrs. Miller has taught school, written for newspapers and written a score of books about Westerners and life in the West. This has a readability level of grade four and five. It is one of the Putnam American Hero and Pioneer Biography series. The text is written in a high interest manner for young readers without dates to encumber the narrative. The map of Jedediah’s 1826-1828 travel is accurate except for placing his trail through Ebbets Pass. Historians dispute the route through the pass. It is purported, instead to be on the ridge north of the pass. There are twenty-two illustrations which enhance a visual concept of the story. A three page index completes this work for young readers. Latham, Frank B. Jed Smith, Trailblazer. NY: Aladdin Books, 1952. Illustrated, map, pp. 192. Frank Latham created a fictitious opening chapter to hook the reader that this would be an action adventure. In the remaining chapters he uses an interesting blend of historical narrative and fictional dialogue to keep the interest in this hero genre. The history has been accurately portrayed. The story closes on 1829 with another creative dialogue, this time with William Sublette. This title is part of the Aladdin publishing, The American Heritage Series. Thirty-six Frank Murah pen and ink illustrations have been carefully drawn to provide accurate historical visual observation for the narrative. The map Jed’s Country avoids the Ebbetts Pass controversy but incorrectly locates his departure from California by a route east of Mount Shasta. Historically, Jed left by an arduous and difficult route directly to the coast. This book is recommended for juvenile readers in grades five through eight. It is of high interest. Burt, Olive. Jedediah Smith, Fur Trapper of the Old West. NY: Julian Messner, Inc., 1951. pp. 187. Illustrations, bibliography, index. Each chapter begins with a half page, carefully drawn illustration by Robert Doremus which reflects one of the themes of the chapter. 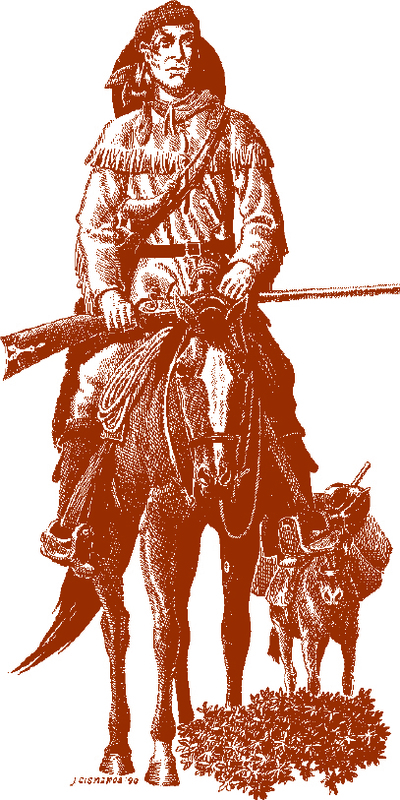 The story begins in St.Louis and ends with the Comanche killing of Jed near the Cimmarron River. Olive Burt has prepared an interesting work for student in grades eight through twelve. It has historical depth and less emphasis on the American hero theme. The fifty-five item bibliography acknowledges many of the major writings on the subject of mountain men and the history of the fur trade. It offers sources for further readings on research with composition at an adult level of understanding. The index is five pages. Burt, Olive. Young Jed, Westering Boy. NY: Bobbs Merrill Co. Inc., 1954. pp.152 Illustrated, map. Another of the Childhood of Famous Americans Series, written for fourth/fifth grade readers. Illustrations are a set of silhouettes with pen and ink lines added. The single map illustrates the “Unknown County”. Jed’s travels are not indicated. “Wampum!” yelled Jed. “Here boy!” But the brave old dog still hung to the maddened hog. Jed’s gun was empty, but his hunting knife was in his hand. He stepped in close and sent the knife home. “I never heard tell of such a thing,” his father said when Jed got home with Wampum in his arms. “A twelve-year-old younker killing a wild hog! Olive Burt of Salt Lake City, cherishes the action-crammed history of the West. Her story is told in an exciting and absorbing manner from beginning to end. While these adventures show young Jed as a great American in the making, they also show him as all boy; likeable to the core, bold but levelheaded, quick but sweet-tempered. He is real, live, honest-to-goodness American boy. The book is grand addition to the series. Burt, Olive W. Jed Smith Young Western Explorer. Indianapolis: Bobbs-Merrill, 1963. pp. 200. Illustrations, map, chronology of events, comprehension questions and things to do, suggested readings, vocabulary definitions. Illustrations are of higher student interest. The map is unchanged. The reading list has suggestion for children. The vocabulary list provides short clear definitions. The comprehensive questions and things to do suggestions are a guide for teaching Social Studies and/or Reading. This is definitely a book written for the teacher and student. Evarts, Hal G. Jedediah Smith: Trail Blazer of the West. NY: G.P. Putnam’s Sons, 1958 pp. 192 Illustrations. The writer does elaborate more on the finding of South Pass, Henry’s Fork Rendezvous, the events leading up to the formation of Smith, Jackson, and Sublette, as well as preparation for the California trip. The second half of the book covers Jed’s travels in California, Oregon and Fort Vancouver. The last chapters are concerned with his retirement, details of the Santa Fe experience and a recapitulation of his accomplishments. Occasionally a novel creative error slips into the writing, i.e. “Mountain men looking forward to tasting California oranges.” Otherwise the events are reasonably accurate. Daugherty, James. Trappers and Traders of the Far West. NY: Random House, 1952. Landmark Book Series, pp. 181. Illustrations, map, index. Daugherty’s work is of historical novel genre for middle and secondary school students about John Jacob Astor’s fur trade business. He tells stories of the many players in the overland adventure: Hunt, McKenzie, Liar, Day, McLellan and others. Their adventures are entwined with tales of contact with the Sioux, Omahas, Arikara. Mandon, Blackfeet, and Crow. With the British and Americans involved in the War of 1812, Astor had to abandon Fort Astoria. The author uses dates and locations accurately. However, one glaring incorrect inference stands as a negative. He writes, “Traders were venturing ever farther among the savage tribes of the western plains, offering scalping knives and raw alcohol for beaver pelts.” Traders actually provided many items for trade, i.e. blankets, pots, gun powder, rifles, etc. a few were unscrupulous traders.